Leave it to a little brother shouting out a suggestion, quickly followed by, “It’s not like anyone’s going to read it anyways,” to lead to a blog name. That was the case for Christina Caradona of Trop Rouge—with nearly 140,000 Instagram followers (Take that, little bro'). For most bloggers, their blogs' names came to be thanks to some serious brainstorming, a little luck, and lots of laughs, of course! Continue reading for the stories—straight from the bloggers themselves—behind the names of the world's biggest fashion blogs! "When you think about it, fashion is to blame for a lot of things – good and bad. From never knowing what to wear to simply having too many choices in your closet, to the time when you thought those skinny bleached jeans did something good for your thighs, and to actually feel good about spending thousands of dollars on a new bag. I blame it all on fashion." "I didn't put too much thought into it—I remember being impatient to just have the blog set up already. Fashiontoast got stuck in my head so I just went with it! I liked the idea of reading it over breakfast because that's my favourite time to catch up online." "The name of my blog came about somewhat organically. I started by simply listing words that described my style and what my blog would be about—even just words I liked—and played around with different combinations to see what clicked. The name ‘MODERN LEGACY’ is ultimately a reflection of the essential nature of my blog and what it means to me: a modern way of expressing my style and leaving my mark on the world. A digital legacy, of sorts." "I've always known I wanted my blog to be about more than just fashion and so I was hoping to come up with a name that would hint to that. Also, I'm a big Anglophile and wanted my blog name to be as British as could be. Fash n Chips is obviously a pun on a true British classic: fish 'n' chips. I am not a fan of the dish at all, but I still believe no name could have possibly suited me and my blog better." "Naming your blog is arguably the most important step in establishing it! I wanted my blog’s name to encompass three things: I wanted readers to identify with it, to sound catchy, and, most importantly, to have a personal tie-in. As some of you may or may not know, Margo is actually my French Bulldog! In addition to my daily fashion musings as seen on my instagram page (@margoandme), the blog also chronicles our travels and adventures around the world. Whether we are jet-setting to Aspen or working out of our L.A. office, Margo is always by my side. It’s all about Margo & Me!" 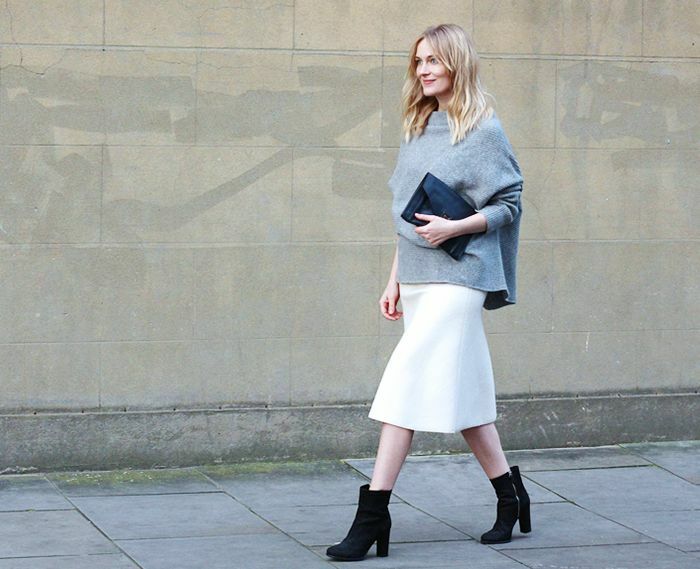 "My blog name, NATALIE OFF DUTY, was really inspired by the 'model off duty' lifestyle. I've been modelling since I was 15, and I am always on the go. It's all about that effortless style that comes with travelling around the world, and taking high-fashion pieces from the brands I've worked with and mixing it with my own unique finds. NATALIE OFF DUTY is a place to share my stories, projects, work, and inspiration through my own photography and writing." "I was with my friend Hilary and I knew I wanted to start the blog but I had no idea what I was going to call it. I knew I loved the colour navy so I kept saying to Hilary, 'It has to be something NAVY.' So we sat there thinking for an hour what we can pair with the word navy. We kept saying, 'Hmmm...something navy, something navy'—and it just clicked/I really just wanted to start the blog already! SomethingNavy was born. Who knew I'd still be saying the name seven years later!" "When I was naming my blog, I actually just really wanted to use an octopus in my logo. I had drawn an octopus grabbing all of these shoes with his tentacles. The name had to be a bit nautical for the logo to make sense, and Sea of Shoes just kind of came to me when I was having Mexican food with my family one day. Haha." "I knew I wanted to incorporate my last name and I initially planned to start an interior design blog and was going to blog about the different interior styles such as midcentury modern, minimalism, Hollywood glamour, etc., therefore the name Song of Style came about!" "Coming up with a blog name was pages and pages of brainstorming and a month-long process for me. I knew I wanted to get it right on the first try. To me, I wanted my name to speak to all aspects of my lifestyle. eat.sleep.wear. speaks to the things I am doing every day. My everyday routine. My everyday life." "When I started the blog I didn't have a plan and I wasn't familiar with blogging. I discovered you could make a blog with a gmail account so I signed up on the spot and had to put in a name, so I just called it the first thing I thought of—STOP IT RIGHT NOW—which was what my friends and I would say when something was really really good or really really bad. I thought, 'I'll just go with that for now and change it later,' but it stuck this whole time. No regrets!" "I wanted my blog to tell the sartorial stories of a 20-something-year-old girl over time. Chronicles of Carmen sounded like a kids TV show so that was out. I also wanted my readers to feel like it’s not only about me, but also about them, so ‘her’ leaves it open to interpretation." "When coming up with a name for your blog you have to be a little creative. That was not my case. It was more coincidental than strategic actually. The Fashion Eaters were born through this fun, self-ironic picture I chose to send to my best friend, where I ate a hamburger from McDonald’s, and changed «donald’s» to «fashion». Yeah. And we kind of went on that train for a while, doing a lot of fun (and sometimes a little bit creepy) edits on our pictures where we ate stuff and named it «fashion». Later on we ended up starting a fashion blog together, calling it The Fashion Eaters. And it just felt right." "Why The Blab? My name is Labériane but it's a little bit long and not common for a french name so all my friends and family call me Labé or Lab. The B is just for 'blog.' And I put a 'The' in front and you obtain 'The Blab.' And to blab means to talk so that makes sense." "My younger brother, Philip Charles, actually named my blog. I remember he was brushing his teeth and I was sitting on my bedroom floor with the door open and I yelled, 'What should I call my blog? Say something in French like trop something.' And he said, 'Call it Trop Rouge, it's not like anyone's going to read it anyways.'" "My blog name came about after some brainstorming and luck. I've always loved play-on-words and I definitely wanted the name to reflect where I was in my life the—in the pursuit of chasing after my dream. The rest just sort of fell into place and THP was born!" "I started the blog seven-and-a-half years ago and back then it was something completely different to what it is now. There wasn't such thing as 'personal style' blogs yet, and my blog was more of a mash-up of things that I loved and inspired me. I was very into doing scrapbooks when I was little and I have a ton of them at my parents house in Mexico, so the first thing that came to my head was to name it 'My Style Scrapbook.' Two years after I started the blog, I chucked the 'My' and I was left with StyleScrapbook. I guess it was a lucky hunch!" Do you have a personal style blog? Let us know how you came up with the name in the comments below!